The economical young gentleman who relegated himself to a wooden "pod" in an Outer Sunset living room, making national headlines for, like, symbolizing the San Francisco housing market, would now like to capitalize on his Internet notoriety and sell you a box of your own. Penning an op-ed in the Guardian, "Why I choose to pay $400 to live in a box" the presumably monastic freelance illustrator Peter Berkowitz even made reference to SFist's coverage of his escapade — Jay did imply a certain degree of abstinence on his part, which Berkowitz appears to have taken in stride. "I love the pod we’ve built," he wrote, giving a nod to his co-conspirators, designer Stan Kim and woodworker Jeff Goodwin. "As I see it, I have all the essentials and then some; privacy, a comfortable place to work due to a fold down desk, perfect light for reading and a tastefully calm place to be in." While all of that is debatable, on Berkowitz' website, he does wryly add that, "Yes, living in a pod is silly. But the silliness is endemic to San Francisco's absurdly high housing prices  the pod is just a solution that works for me." But can it work for you? 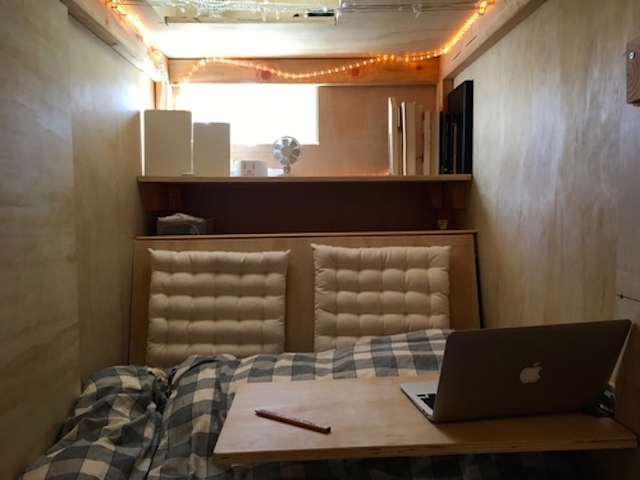 "If you live in the Bay Area and are perhaps quite possibly vaguely interested in maybe having or living out of a pod yourself, please please please send me an email too. I'd love to work with you on building a suitable pod for whatever space/ needs you have at a very very very reasonable price (I'm more interested in getting good at building pods than in making money at this point)." On that plaintive note, Hoodline obtained email, probably not intended for the public, in which Berkowitz attempts to solicit an order. "I'm wondering if you might be interested in having a pod set up (free of charge) in your apartment to enable you to make money from either subletters or Airbnbers," he wrote in an email to a neighbor. "And if it doesn't end up working, I'd also come and take the pod away, again, free of charge. Also, I would help you find subletters or Airbnbers  a lot of people have emailed me who are interested in living in such a situation." “No way I would answer him,” the email's anonymous recipient told Hoodline. "Not only I'm pretty sure the pod thing is illegal, but I'm not contributing to that trend."